It is so often the case that we know a great song (in this case a Hymn), but we don't know who the author is. So, what I would like to do on occasion is share a little background to some of these poets, song-writers and musicians. The timeless Hymns 'Abide with me' and 'Praise my soul, the King of Heaven' were written by the same poet - Henry Francis Lyte and today we will reflect on his life. As you dig a little around his life-story you begin to see that he experienced a fair share of his own struggle and pain, which perhaps makes his writing more sincere. As a teenager, his father arranged for Henry and his brother to attend a school in Ireland, and then proceeded to abandon his family altogether. Years later Henry and his new bride lost a young child, and he also struggled with illness in his late twenties, which is believed to have been asthma and bronchitis. Henry served in various churches as a vicar and died at a relatively young age of 54. So, why am I telling you all this? Well for the simple reason of giving us a little background to some of the great hymns/songs of our Churches and also to show how our personal struggles can shape our lives and testimony. Henry Francis Lyte didn't live a life absent of pain and suffering, yet he used this tribulations to draw near to Jesus and reflect on them through poetry. 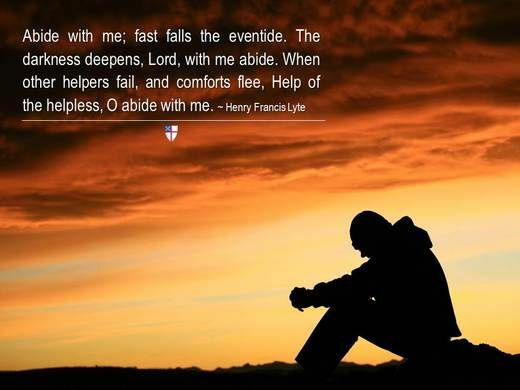 The words of 'Abide with me' have helped so many people deal with their own struggles and grief and so as we read the words again, may we remember that God is always with us. God will ABIDE with us.